Research has proven that prescription drug prices in the United States are among the highest in the world. In 2012, it was estimated that the U.S. weight-loss industry earned about $20 billion from diet books, diet drugs and weight-loss surgeries. When trying to lose weight, most people are worried about two sets of numbers - the numbers on the scale and the numbers in their checking account. Losing weight shouldn't break the bank. We are proud to announce to all U.S. residents that you now have options! You have unlimited access to prescription weight loss coupons and discounts. These coupons and discounts are provided to you and your loved ones at absolutely no cost. No need to apply, enroll or activate the card or coupon. Simply locate the diet pill from our coupon list, print the coupon and bring it to your pharmacy to receive a discount at point of sale. You also have the option to print our Weight-Loss Rx Card. You could be saving up to 75% on those expensive prescription diet pills! Our cards and coupons are accepted at over 60,000 pharmacies nationwide and DO NOT expire! It's Free! All residents of the U.S. are eligible to receive pharmacy discounts through our cards or coupons. This program can be used to supplement most health insurance plans including Health Savings Accounts (HAS) and High Deductible Plans. It can also be used as a Medicare Part D Supplement by providing discounts on medications that are not covered (non-covered drugs). No Hassle! There are absolutely no restrictions. There are no enrollment forms to fill out, no age or income requirements, no wait time, no eligibility requirements, no exclusions, no claim forms to file, no annual or lifetime limits. It even covers pre-existing conditions! Open Formulary! All medications are eligible for discount with Weight-Loss Rx. Yes, that includes discounts on brand name and generic medications. Accepted Nationwide! The Weight-Loss Rx Card and Coupons are pre-activated and accepted at over 56,000 pharmacies around the country including most major chains. How does the Weight Loss Rx Prescription Medication Savings Program work? WeightLossRxCard.com is partnered with companies that negotiate discounts directly with the pharmacies on over 20,000 name brand and generic medications. These discounts are then passed directly on to cardholders. Who is eligible to participate in the Weight Loss Rx Prescription Medication Savings Program? The Weight Loss Rx Prescription Medication Discounts program has no requirements. Unlike insurance programs, there is no income, age, pre-existing condition, deductible, or waiting period restrictions. The program is designed to help patients nationwide who do not have prescription drug coverage or who have coverage but are subject to large deductibles, large co-pays, formulary limitations, dosing limitations, gaps, and/or any cash out-of-pocket expenses. How much does a WeightLossRxCard.com card/coupon cost? The Weight Loss Rx Prescription Medication Discounts Program is absolutely FREE. We provide this service to every American that wishes to save on their prescription prices. There are no premiums or deductibles associated with this program whatsoever. Printable cards and coupons are available free of charge from our website. How do I use the Weight Loss Rx Prescription Medication Discounts Card? Select a pharmacy: the Weight Loss Prescription Savings Card is valid at over 56,000 network pharmacy locations nationwide. In most cases, your current pharmacy will be part of our network. 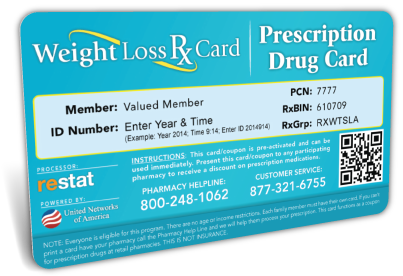 Present your Weight Loss Prescription Savings Card: Your card's unique code provides the pharmacist with the appropriately discounted prescription price. The price on the prescription is based on the pharmacy's contracted agreement with WeightLossRxCard.com and our partners. You Save: Your savings will be clear once the pharmacist enters your filled prescription into the register. Whether the lowest discount price is the Weight Loss Rx savings price, your present insurance program's price, or the pharmacy's already discounted price, you are GUARANTEED to receive the LOWEST price available! The discounted price may vary by as much as 75% depending on the drug and the pharmacy discount rate contracted with . While pharmacy prices may vary from week-to-week and by the geographic location, the patient is guaranteed the lowest price available regardless of whether it is the price, your present insurance program's price, or the pharmacy's already discounted price.